This is the third entry in a series of Technology Spotlight articles created with the help of our MSP partners. The series’ purpose is to educate our customers and partners about topics that they might find helpful. The subject here is the benefits of working with managed services providers (MSPs), many of whom we count as valued partners. 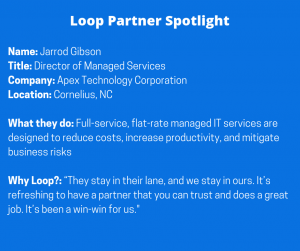 We asked our friend and partner Jarrod Gibson of Apex Technology to share his insights on this topic, which Loop founder/president James McKinney also discussed with us recently. What is the typical size of your customer? We handle businesses from 10-12 employees to those up to 100. Our average client has about 40 employees, but our model scales to any size, up to 100, 150 or even more. 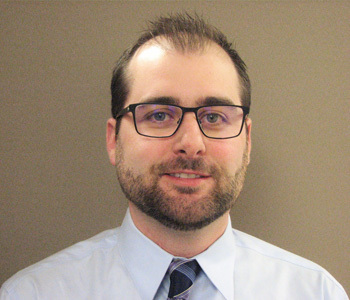 The market is changing, and businesses that have internal IT use managed services partners like Apex to partner with internal staff. What problems do you see with businesses that work with MSPs? The biggest issue we see is a general sense among businesses that all IT partners and managed services providers are created equally. Let’s say they’ve worked with the for 10 years – they feel comfortable with them, and trust them. Unfortunately, the structure of the agreement does not always align the IT vendor with the customer. These customers are under break-fix, reactive IT support agreements. They call the IT vendor who comes out to fix a problem, and the parties don’t engage again until there’s another problem. What we do is a completely managed services agreement by which we provide a business with all of the security tools, products, support and services the customer needs at a fixed monthly cost. That incentivizes us to make sure they don’t have problems. It’s better for us to make sure they have all the necessary security measures and best practices in place to prevent breaches or data loss. Four of the six clients we’ve onboarded over the last several months have been under some form of cybersecurity attack, but only two of them knew it. One example of that is e-mail phishing, where someone spoofs an e-mail address and sends an e-mail to the office manager asking for money to be wired. We’ve also onboarded customers whose firewalls are wide open to the world, with hackers from China and Russia pounding on their servers. These things often get overlooked, largely due to the types of agreements that businesses have with their IT vendors. Is there ever an argument for a break-fix service agreement rather than a full-service, retainer model? The reality is that your data is important to you. If you store important things on your computers, such as payroll or customers’ financial information, it matters. To rely on fixing things only when they break is never a good idea. Can you give us an example of a customer that was in a bad place due to such an agreement? We recently took over responsibilities for a company that had been with its IT vendor for several years. Backup and security were included, but they didn’t even have antivirus tools installed on their servers. They had two terabytes of data, but only 200 gigabytes on the backup servers. The company thought these duties were being handled properly. They should be basic services, and even though it wasn’t malicious, that IT company wasn’t incentivized to provide a managed solution the way an IT partner is. What are the perils of a company trying to handle IT internally? When a 75-person company (for example) hires an internal IT staffer to handle everything, there aren’t a lot of checks and balances. What that person says goes. We’ve been in situations where we’ve replaced that internal person, and found many band-aid solutions. There’s not always a proactive approach because – again – there isn’t always an incentive to be that way, like there is for us. There IS a job security element to being the person who is always needed. Our goal for clients is to increase employee productivity, mitigate their business and security risk, and not have them worry about IT. Our model – to be their CIO, and develop a strategy for IT – allows us to shine for companies with 50-plus employees. Our team approaches things from a business standpoint as well as an IT standpoint, using information from our engineers to help strategize IT goals with business owners and CFOs. What questions should a business ask a potential managed services partner? First, they should look at the structure and nature of the agreement that the IT partner is offering. Specifically, is the structure a break-fix model, a block time model or a hybrid model, or is that IT partner all in with them? That tells the business a lot about what the IT partner is doing from a process standpoint to ensure that the network environment is as secure as possible. We see fewer block time agreements than we used to, but there’s no incentive there for the IT vendor to resolve issues the first time they occur. It’s prepaid money, and as issues come in, time is deducted. Secondly, what are the checks and balances involved in the IT partner’s support offering? We have a support team and a field engineer team, but also have a completely separate team of centralized service engineers that handles monitoring, security services, and making sure computers are patched and updated with antivirus software. We also have two other teams – the network administration team and the CIO team (which is my role). The network admin is executing best practices reviews and checks and balances against what we’re already providing to our clients. It’s another layer of oversight that’s not part of agreements with different structures. What are the benefits of working with Loop? We have a great partnership with Loop. I spent 10 years trying to find a good phone partner. They all either wanted to get into the IT space like us, or just seemed a bit shady. 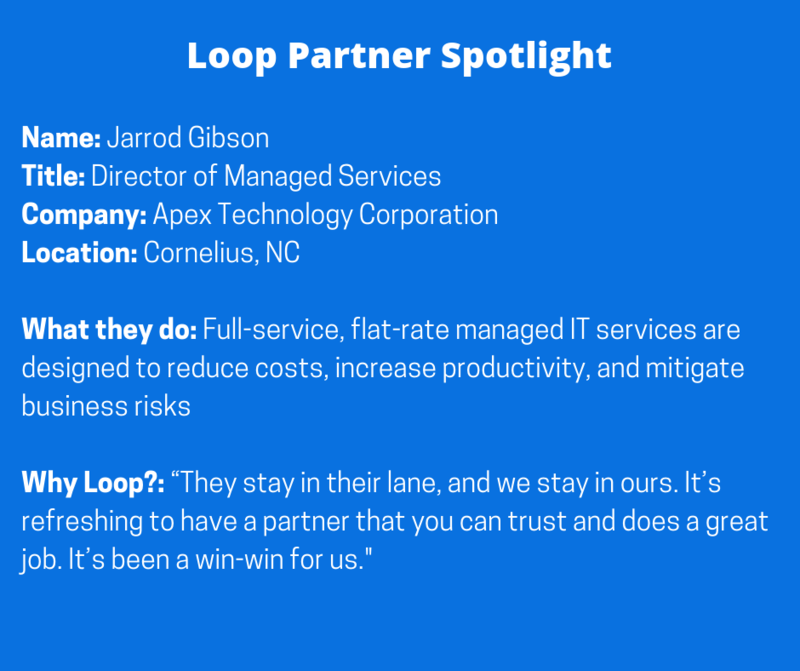 We met Loop via a mutual client, where we started to handle the managed services and they were already providing the phone system. We liked the product and the service, and then when a phone opportunity came up with another client of ours, we introduced Loop, and the implementation went well. Then we decided to implement Loop’s offering internally, and the partnership took off from there. We’ve probably had five or 10 rollouts together, with more coming in Q1 of 2019. They stay in their lane, and we stay in ours. It’s refreshing to have a partner that you can trust and does a great job. It’s been a win-win for us. Do you have any questions about managed services providers, business phone systems or another idea for a topic you’d like us to cover? Contact us now!